The History of Belle Grove begins with the German immigration into the Shenandoah Valley of Virginia. In 1732, Jost Hite with his business partner Robert McKay and 16 families, journeyed to the northern Valley to settle on 140,000 acres obtained in two land grants. Isaac Hite Jr, grandson of Jost Hite attended William and Mary College and served in the Continental Army during the Revolutionary War. In 1783, his father gave him and his bride Nelly Conway Madison, sister of a future President of the United States, the 483 acres on which Belle Grove Manor House was later built. In 1794, construction began, and was completed in 1797. The grand mansion was built with limestone quarried on the property and faced the Valley Pike to display the owners social and financial status. Isaac and Nelly Hite had three children and two lived to adulthood. After the death of Nelly in 1802, Major Hite married Ann Tunstall Maury, with whom he had ten children. In 1815, as the family grew, an addition was made at the west end of the original house to create the 100-foot facade as it stands today. The grain and livestock plantation continued to grow until Major Hite controlled 7,500 acres of land. Hite also owned a general store, a grist-mill, a saw-mill and a distillery. Hite family records indicate that they owned 276 slaves at Belle Grove between the dates of 1783 and 1851. Among the first enslaved Africans that the Hites owner were 15 individuals deeded to Hite by his father-in-law, James Madison, Sr. They were named Jerry, Jemmy, Sally, Milley, Eliza and her five children: Joanna, Diana, Demas, Pendar, Webster, and Truelove and her four children: Peggy, Priscilla, Henry, and Katey. Eliza and Truelove's families would be at Belle Grove for three generations. Although no slave quarters are extant there is a small cemetery believed to be the final resting place of some of the enslaved. Extensive research is underway to learn more about the individuals that were enslaved at Belle Grove and about their lives and families. Major Isaac Hite, Jr. died in 1836, and nine years after Ann’s death in 1851, Belle Grove was sold out of the family. By the start of the Civil War in 1861, Belle Grove no longer existed as it had during the Hite era. It was occupied several time during the war, most noteably by Union General Philip Sheridan in the fall of 1864 and Belle Grove found itself in the center of the Battle of Cedar Creek on October 19, 1864. There was a succession of owners before the Brumback family bought what remained of the farm in 1907, and then Francis Welles Hunnewell purchased Belle Grove from the Brumbacks in 1929. Much is owed to the thoughtful preservation efforts of these 20th century owners. Belle Grove, one of the outstanding historic mansions of the Shenandoah Valley of Virginia, shows evidence of the cultures that came to the Valley with the early settlers. It also identifies with ideas that were shaping architecture at the time. Like other period houses built in the Valley, the design shows Thomas Jefferson's influence from the Tidewater and Piedmont areas, and also Classical Revival elements, an architectural innovation of the day. The interior is distinguished by fine woodwork in a transitional style ranging from Georgian to Federal periods. Outlasting weather, war, family triumphs and tragedies, Belle Grove testifies to the persistence and courage of those who strove to excel, and who built their homes to make a lasting mark on future generations. As a prized survivor of regional and national significance, Belle Grove is a National Historic Landmark, a Virginia Historic Landmark, and a historic property of the National Trust for Historic Preservation. 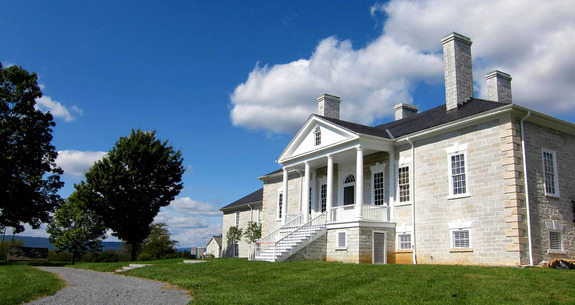 The centerpiece of the Cedar Creek and Belle Grove National Historic Park, Belle Grove serves the Shenandoah Valley and Virginia as an educational center through the many interpretive programs it offers. Its highest priorities are to stimulate historical and preservation awareness among regional residents and visitors from the United States and throughout the world. Today the farming tradition at Belle Grove continues. Much of the property is still used for agriculture, there is a teaching garden that demonstrates some of the plants grown for household use, Copper Fox Distillery in Sperryville, Virginia has recreated a Virginia whiskey similar to what the Hite distillery made (click here for more information), Belle Grove's annual "Of Ale and History" Beer Fest (May) and Wine Fest (August) features Virginia products, and the Museum Shop carries local items that highlight Virginia agriculture. Read more about the history of Belle Grove Plantation at their website.